Our buildings play an essential part in providing shelter and protection for an integral part of our ecosystem, the 18 species of bat that live in the UK. Creating roosting spaces for bats is an important conservation action, as all UK species are known to roost in buildings, with some species relying on them more than others. UK bats don’t construct their own roosts, so are often reliant on man-made structures that are already available to give them a suitable habitat. There is some concern that future housing stock won’t be able to offer adequate roost space for bats, threatening their survival. 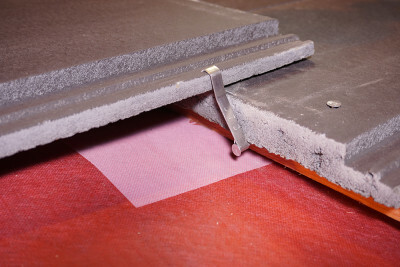 With the architectural trend for airtight buildings, there are less crevices and roof access points for bats to utilise. Therefore, making room for bats in our buildings is becoming part of creating eco-friendly homes. All bats and their roosts are protected by law and it is an offence to deliberately disturb, handle or kill bats. The potential fine for destroying a roost is £5,000 per bat or six months in prison. Planning authorities have a legal obligation to consider whether bats will be affected by a proposed development and this legislation should be incorporated into their planning policies. 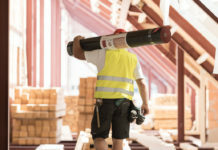 Taking bats into consideration before starting any work protects you from prosecution, whilst also minimising any costs or delays later down the line. Having bats doesn’t mean that building work, roof repairs, pest control or timber treatment cannot take place and your local SNCO (Statutory Nature Conservation Organisation) can advise. Non-invasive checks into roost areas can be done without needing a licenced bat worker, but closer checks and work on a roost should be completed by a Natural England EPS licenced worker. Bats often use roof areas to shelter but different bat species require different kinds of spaces during the year, preferring a warm space in the summer to rear their young and a cool space in winter to hibernate. Pipistrelle bat species will rarely enter a roof void but will use building features such as soffits, fascias, hanging tiles, gaps between roof tiles, roof lining and lead flashing for shelter. Brandt’s bats and whiskered bats are also crevice-dwellers but may enter roof spaces to fly around. These crevice-dwelling bats only require a small 15-20mm high gap to crawl into their roost. Long-eared bat species prefer older buildings and will occasionally roost in the open within the roof void. Horseshoe bats use buildings during the summer months but as they are poor crawlers they need roof spaces with easy flight access rather than bat boxes. Bat boxes are suitable eco-habitats for some species of bats. They have the advantage of offering a permanent space for bats that requires little maintenance and has good thermal properties. 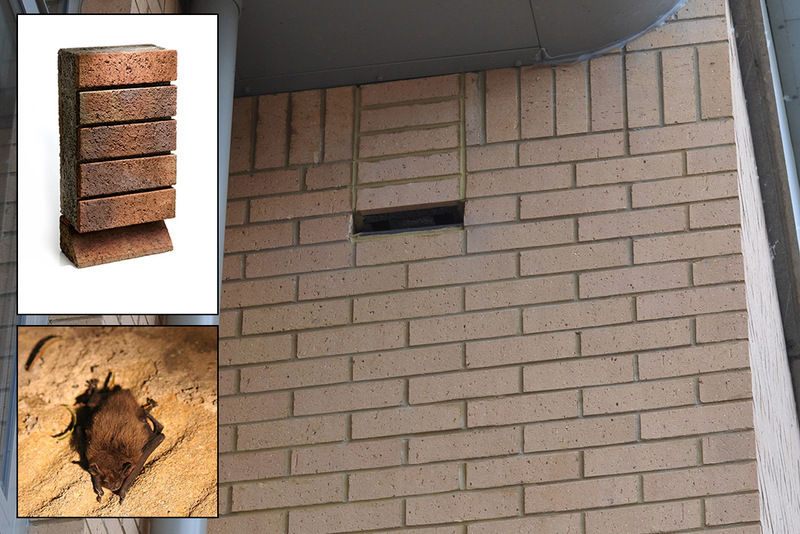 Bat boxes can be made from brick, featuring a plinth detail at the bottom to allow bats to enter and exit. They can be integrated into the façade of the building, using the same brick or installed retrospectively. Bat boxes can be opened at the rear to allow access into roof cavities or roof spaces, or they can be embedded so they don’t impair the airtightness of the building. Bat boxes should be placed as close to the eaves or a gable apex as possible, at least 4 metres off the ground and away from windows, door and wall climbing plants to keep the inhabitants safe from predators. Roof tiles can also create eco-habitats for bats. 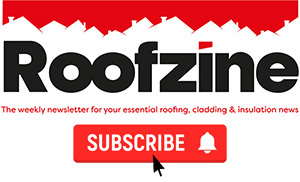 Slightly raising roof tiles by putting a small amount of mortar at the bottom of a tile to lift it up (by 20mm x 100mm), spacing two adjacent tiles slightly apart, cutting a small section out of ridge tile or placing a ridge tile on top of two neighbouring tiles are all simple ways to give bats access through small gaps whilst preventing rainwater ingress. 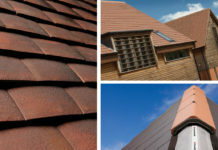 Modified access roof tiles are also available as a more aesthetically pleasing and subtle option. The right amount of access or raised tiles should be installed to ensure conditions are suitable for bats; too many and the temperature of the space will alter, but too few and bats may get trapped inside. 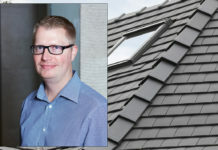 In order to encourage the construction industry to create much-needed habitats for British wildlife, Wienerberger offer bat and bird boxes and access tiles in a variety of styles.